Coffee is loved unanimously around the globe and is being developed into a more highly sustainable commodity thanks to the cooperation and commitment of the world's farmers all the way through to its consumers. DAKMAN has been working with the farmers for over 15 years maintaining strong support and encouraging long-standing, honest relationships. Through certification state, science, exporters and farmers are united, open discussion is promoted and knowledge and expertise are combined and shared. The coffee growing communities in Vietnam make up a large proportion of the population. DAKMAN is fully aware of the commitment, importance and responsibility needed to help support and work with these communities. DAKMAN works on a number of social projects from small to large, independent to group-driven with a universal aim of making a difference in the lives of those we work with. Training courses, field work and interaction with our farmers are all part of DAKMAN's commitment to excellent communication. This transfer of knowledge and improved farming techniques guarantee a higher and more stable income to the farmer. DAKMAN is committed to doing everything possible to ensure natural environments are protected and conserved in the best possible way. DAKMAN supports training groups on good husbandry, first aid, fire safety and GAP (Good Agricultural Practice) to encourage farmers to use safe and responsible methods that benefit both the farm and its surrounding environment. Farms are visited and surveyed regularly to maintain the comprehensive standards set by the certificate awarding bodies are upheld and to provide the farmers with support and encouragement. DAKMAN has been certified to trade Fairtrade coffee sourced from over 130 Fairtrade certified farmers. The group of Fairtrade cooperatives is a solid base for new projects and development in coffee farming. DAKMAN was the first company in Vietnam to receive certification from the 4C association, the world's longest standing coffee certification body. The Rainforest Alliance empowers farmers to improve agricultural methods and working conditions in order to preserve, conserve and ensure the environment is protected for generations to come. 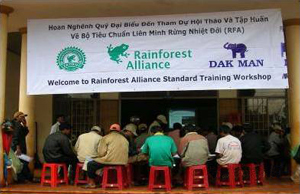 DAKMAN is one of only a few companies in Vietnam that can offer Rainforest Alliance Certified™ coffee in Vietnam. Over 1000 farms working with DAKMAN adhere to this certification's comprehensive and varied criteria. DAKMAN has been a member of Utz since 2006 and is proud to be able to provide coffee that is truly 'good inside' for over 4 years. We relish the opportunities created by UTZ to really make a difference in the everyday lives of coffee growers and their communities.